Creating flyers has never been so easy! By filling out a simple form, you can create a beautiful, professional flyer that separates you from the competition. 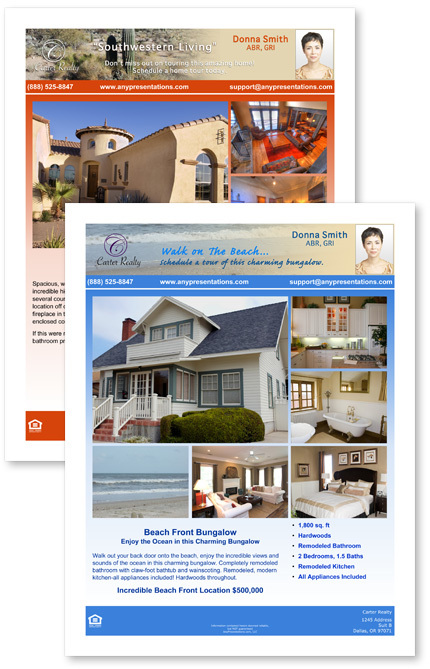 Our flyers are elegant enough for an open house or as a handout to prospective buyers. Give your flyer the next level of personalization with a custom masthead. Create your own unique masthead with your logo, photo, title, contact info with our easy step-by-step process that automatically inserts into your flyer. When you upload the photos you wish to use in your flyer, they will be resized and/or cropped to fit your flyer automatically. Your print flyer subscription allows you to create as many flyers as you wish at no additonal cost. 1. Personalized mastheadSubmit a photo, company logo and your website to our design team so they can create a personalized masthead for your newsletter. After it has been created a preview will be sent to your e-mail for approval. 2. Automatic Image ResizingWhen you upload the photos you wish to use in your flyer, they will be resized and/or cropped to fit your flyer automatically. 3. Multiple FlyersYour print flyer subscription allows you to create as many flyers as you wish at no additonal cost. 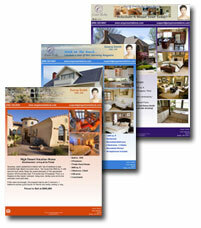 FREE - Until market conditions change, we are offering flyers at no cost.